Outside Oslo’s Munch Museum there’s an uncanny tree that could belong in one of the artist’s paintings – its boluses grouped in a foreshortened face, the grain forming a close swirl. I had the feeling it had been selected to prepare visitors, or acquired from one of Munch’s properties. It was the final weekend of ‘Munch 150’, and the last opportunity I (or anyone) would have in at least a century to see most of the painter’s major works and many of their variants gathered in two galleries: the museum and Oslo’s National Gallery. 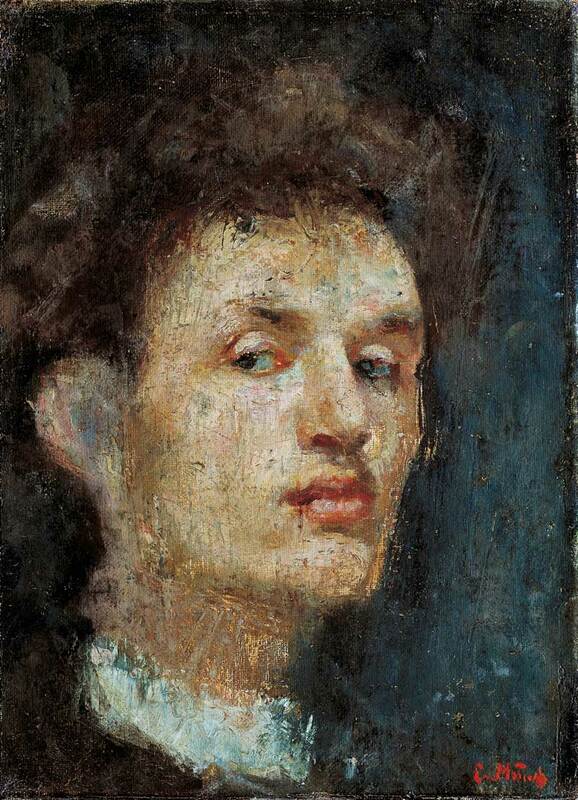 The famous Self-Portrait with Cigarette (1895) had been touring Svalbard for the past year and was here exhibited in its temperature-controlled case. One room in the National reconstructed the original Berlin showing of The Frieze of Life, though some of these paintings were reproduced, the originals too fragile to travel. Munch would have objected to the care now taken with his paintings. He hated varnish and would leave canvasses outside for months or years so their colours would ‘collect themselves.’ He’d kick them, spill drinks on them, let his dogs run over them, or use them as pan-lids in the kitchen. 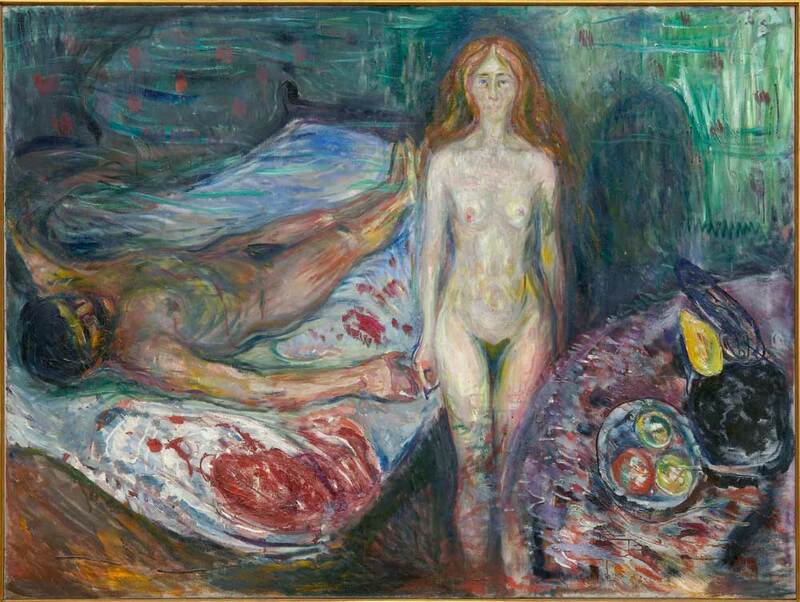 For Munch, this was part of the paintings proving themselves worthy of posterity. Because of Munch’s treatment of his canvasses, if you don’t see the real thing you see less than half the image. In one of his Deathbeds, you can see where rain has caused the bedridden figure of the artist to bleed into the bed. In a self-portrait with a cigarette, his moustache is done in the soft ultra-violet of the smoke surrounding him, or, as Munch describes smoke in his St. Cloud Manifesto (1889) ‘that blue-grey tobacco-laden air.’ In his early paintings he has taken a knife to their finish, and magnifying glasses on strings were sometimes provided (though quite arbitrarily). Like Picasso, Munch could do realism if he wanted. But either because you take this for granted, or because you are sometimes made to forget, looking at his paintings this close and in succession yields surprising moments of technical clarity. He was considered to be a bad painter of hands, but he was brilliant at shoes, as evident in the many full-length portraits on display; he must be one of the most expressive painters of shoes that ever lived. He disliked the inclusion of fruit in paintings, but in his first Death of Marat (1907) – a painting depicting the histrionic crux of his life, where he shot his finger in front of a tormenting lover – apples in a bowl are given a wonderful scuffed brightness. By his later portraits he could do his face in a couple of strokes; you know it’s him, and he’s all there. Having all these paintings in the same place is a great historical gesture, but it is rather exhausting. At ‘Munch 150’ you are taking in one of the most intense of artistic minds, in a few hours, and the profusion of masterpieces inevitably raises your tolerance for great art so that whole rooms don’t draw the eye. I envied a vast group of guided tourists in the National who dashed from a Sick Child in the first room to a Scream, skipping three brilliant rooms, then squandering the rest of The Frieze room. I almost felt the compulsion to follow their lead, just to be perverse. There’s no need to visit the ‘Fairy Tale’ forest room, or the paintings of children room, though if they were part of any other collection you’d probably worship them. Then there are the extracts from his writing. Munch’s narrative diaries are often good and clever; his letter prose can be very funny. The literary sketches or prose-poems chosen for the gallery walls were undergraduate to abysmal. I ‘did’ the two galleries in two days, along with Munch’s murals in Oslo University. It certainly spoilt me for the Astrup Fearnly Museum of Modern Art the following day. The ‘Anniversary Exhibition: Munch 150’ was a collaboration between the Munch Museum and the National Museum of Art, Architecture and Design, open from 7 June–13 October 2013. 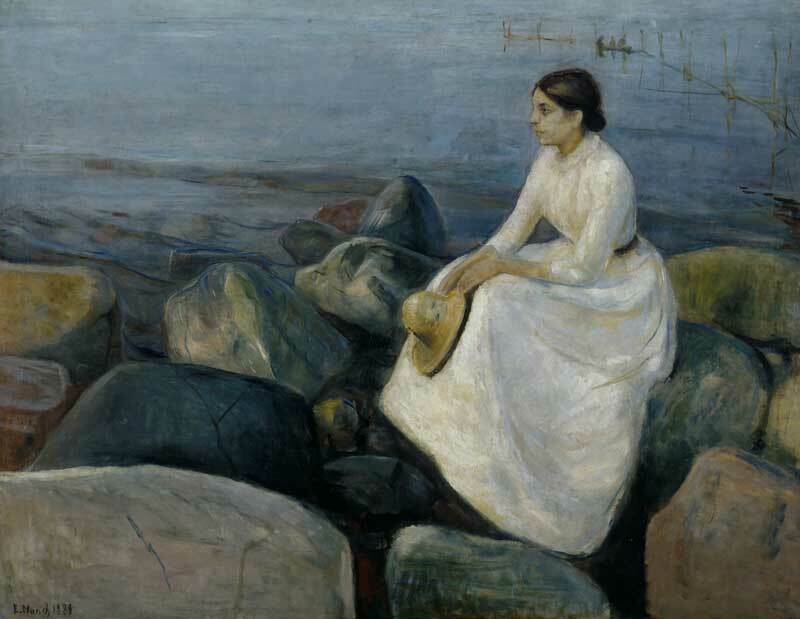 The exhibition formed part of a wider cultural programme celebrating the 150th anniversary of Edvard Munch’s birth.